John Wake analyses the Phoenix real estate market using Phoenix MLS (Multiple Listing Service) data. The metro Phoenix MLS comes out with new data each month on the number of homes sold, the median price of the homes sold, the number of unsold homes listed for sale, and the number of new listings that hit the market each month. INVENTORY. The inventory of homes listed for sale in metro Phoenix FINALLY leveled off in April and May. In a typical year, the inventory would fall from February through June but this year the inventory actually increased sharply in February and increased a bit in March instead of falling. That’s huge. I didn’t expect that. The strong home price increases in 2012 and the first half of 2013 apparently made home sellers a lot more enthusiastic about selling while the higher prices (and higher interest rates since last spring) made home buyers less enthusiastic about buying. PRICES. The median home price in Metro Phoenix rose a bit in April to $190,000 (all homes), however, I know from looking at zip code data that the median price has fallen slightly in some zip codes over the last few months. The unexpectedly weak high season suggests a weak summer and fall for prices. I’m thinking this morning that metro Phoenix home prices will generally drift slightly lower during the second half of the year. This would be a good time for banks to loosen their unnecessarily tight lending standards. The inventory of homes listed for sale in the MLS continued to increase in March although I had expected it to fall, as it would in a normal year. The increase reflexes a ton more homes hitting the market this year compared to last and a lower number of sales, both because home prices are significantly higher this year compared to last. Video covers data through February 2014 for home sales and price and through March 15 for housing inventory on the Phoenix real estate market. TIP – To improve the quality of the video, 1) click on the YouTube logo near the bottom right to watch video on YouTube, 2) click on the “gear” near the bottom right of the video, and then 3) select on “1080p HD”. The median home price in Metro Phoenix continued flat in January 2014. Often we see a price bump in March closings and the size of that March bump tells us a lot about how the rest of the year will go. So, we won’t really have a good idea how 2014 will play out until we have March sales data in mid-April. Inventory spiked seasonally in February but not by an unusually large amount. There is a strong multi-year trend of lower home sales as home prices increase. Video covers data through January 2014 on the Phoenix real estate market. The median home price in Metro Phoenix has been flat since July after skyrocketing the previous 24 months. The number of homes for sale continued to increase rapidly in December. Video covers the latest data on the Phoenix real estate market. Video covers the latest Phoenix real estate market data. Inventory starts to skyrocket. Phoenix inventory of homes for sale increased steeply in September. Is this a trend? I think so. Video covers the latest Phoenix real estate market data. The median home price in metro Phoenix continued to increase strongly in March, up $6,900, from $172,000 in February to $178,900 in March (and up $62,850 from $116,050 in August 2011). The median home price in metro Phoenix has increased 54% since August 2011 but the number of homes listed for sale still has not responded to the price increase. The purple line in the graph below shows the number of new MLS listings per month. Compare it to the green line which is the median home price in metro Phoenix. We’ve seen no supply response yet to the 54% increase in home prices. The price increase, however, has lowered the quantity demanded. The total number of single family homes sold January-March 2013 is down 9% from the same period in 2012. My forecast from January is looking good. The number of metro Phoenix homes listed for sale is still not responding to the 42% price increase over the last 18 months! The number of new listings was about the same number this January as last January even though the median home price in metro Phoenix was 28% higher this January compared to last. It’s nuts! But it’s a cool economic puzzle to be solved! See last month’s post for why I think the Phoenix median home price will increase strongly again this spring. It’s hard for me to believe that I haven’t updated the “Phoenix Real Estate Market at a Glance” graph since last summer. Actually, I’ve been updating the graph each month but not doing a post here about the changes. I think what’s happening is that I usually have so much I want to say about the graph that I wait until I have more time to cover the topic thoroughly… but I never get enough time to cover the topic thoroughly. So here I’m not going to cover the topic thoroughly, I’m just going to make a couple of quick points. I expected that with the big price increases last spring that the supply of homes listed for sale would increase this fall. It hasn’t. In mid-November 2012, the total supply of single family homes is LESS than it was at this time last year even though prices are significantly higher! The price increase last spring hasn’t – yet – brought out more supply. The number of new listings has stopped falling after 6 years of steep declines but the number of new listings hasn’t started to increase yet. The real estate market has huge lags between cause and effect, 1 to 2 years is not at all unusual. Does that mean that we might not see an increase in supply – despite the higher prices – until 2014! I had expected the metro Phoenix median home price to increase next spring by maybe half as much as last spring. But now since the supply is even tighter than last fall, I think prices could conceivably increase as much as last spring. That is, I’m thinking this afternoon that the median home price in metro Phoenix could rise from its current $160,000 (October 2012), to $180,000 to $200,000 next year. $180,000 seems like an easy goal. $200,000 seems unlikely but not crazy. As always, I have to stress that this doesn’t mean your personal home will increase that much in price. Different zip codes will appreciate differently but I expect all zip codes to appreciate next year. Also be aware that if you plan to sell your current home and buy another, that the metro Phoenix home you want to buy next year will also be appreciating. Phoenix home sales (blue line) in June 2012 (7,807 homes sold) was the lowest number of sales for a June since 2008. The number of homes listed for sale in metro Phoenix (red line) in July 2012 was 16,226, which was the lowest inventory of single family homes listed for sale in metro Phoenix for any month since September 2005. 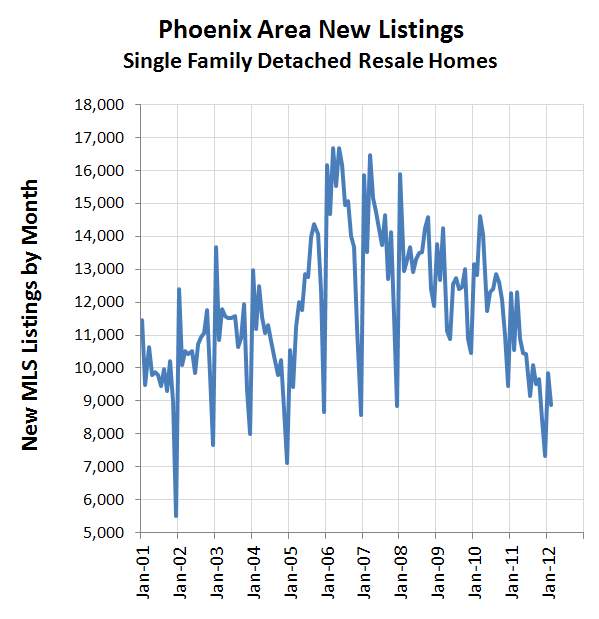 The number of new listings hitting the Phoenix MLS in April was only 9,271, which is very low. The sharply higher median home price in metro Phoenix hasn’t increased the number of homes hitting the market… yet. The Phoenix median home price (green line) FELL $3,000 in June to $150,500 but it’s still over $34,000 (or 30%) above August 2011 ($116,050). See full post – Phoenix foreclosures as percentage of homes sold continues to decline. I want to make one point from the graph below. This is the best time to sell a metro Phoenix home in 3 years. Not only is, 1) the median home price higher than it’s been in 3 years, but 2) your odds of actually getting the home sold is unusually high. We’re seeing an unusually high percentage of homes listed for sale that actually get sold. That reduces your selling hassles – the interruptions to your life caused by showings, the keeping the house constantly immaculate, the uncertainty of not knowing when and if you will be moving. In more typical times, a much higher percentage of listings fail to get the home sold then now. If your living situation is such that you want to sell now, you can feel good knowing that this is the best time to sell in the last 3 years. And please interview me (John Wake, HomeSmart) at (480) 600-0947 for the job of helping you to get that house sold. Phoenix home sales (blue line) in May 2012 (7,152 homes sold) was the lowest number of sales for an May since 2008. Demand is high. But since the supply of homes for sale is so low we’re not seeing the high demand showing up as increased home sales, instead we’re seeing the high demand showing up as rapidly increasing Phoenix home prices. The number of homes listed for sale in metro Phoenix (red line) in June 2012 was 16,354, which was the lowest inventory of single family homes listed for sale in metro Phoenix for any month since September 2005. The number of new listings hitting the Phoenix MLS in April was only 9,270. The last time the number of new listings hitting the market in an May was that low was probably in the 1990s. The Phoenix median home price (green line) increased $4,900 in November, $100 in December, $3,500 in January, $1,500 in February, $9,000 in March, $8,000 in April, and $6,500 in May to $153,500. Since August 2011 the median Phoenix home price has increased over $37,000. Phoenix home sales (blue line) in March 2012 (7,387 homes sold) was the lowest number of sales in March since 2009 but I think that is because the inventory of Phoenix homes listed for sale is so small, it’s affecting sales. The number of homes listed for sale in metro Phoenix (red line) in April 2012 was 17,725, which was the lowest inventory of single family homes listed for sale in metro Phoenix since September 2005. A huge difference, however, between September 2005 and April 2012 is that in September 2005 the inventory of homes listed for sale in metro Phoenix was skyrocketing upward while today in April 2012 the inventory is continuing to fall quickly. The number of new listings hitting the Phoenix MLS in March was only 9,492. The last time the number of new listings was that low in a March may have been in the 1990s. At current low prices, Mr. and Mrs. Homeowner are not enthusiastic about selling their home so the sharp decline we’ve seen in new bank-owned listings is not being replaced by larger numbers of new Mr. and Mrs. Homeowner listings. The Phoenix median home price (green line) increased $4,900 in November, $100 in December, $3,500 in January, $1,500 in February and $9,000 in March to $139,000. Most impressively, the recent Phoenix median home price increases happened without the temporary $8,000 tax credit which drove the price increase in 2009 (and led to the price declines in 2010). Phoenix home sales (blue line) in February 2012 (6,010 homes sold) were the second highest in any February since 2000. Only February 2005 — the height of the real estate mania — had more sales than February 2012. The number of homes listed for sale in metro Phoenix (red line) in March 2012 was 19,169, which was the lowest inventory of single family homes listed for sale in metro Phoenix since October 2005. A huge difference, however, between October 2005 and March 2012 is that in October 2005 the inventory of homes listed for sale in metro Phoenix was absolutely skyrocketing upward while today in March 2012 the inventory is continuing to fall quickly as it has for over a year now. New listings hitting the MLS in February were 8,884 which is way below previous Februarys and continues the decline we’ve seen over the last 6 years. The Phoenix median home price (green line) increased $4,900 in November, $100 in December, $3,500 in January and $1,500 in February to $130,000. This is a very strong beginning to the high season, January – June. Factoid: Twice as many homes sold (blue line) in metro Phoenix in January 2012 (5,425) as in January 2008 (2,707). The number of homes listed for sale in metro Phoenix (red line) was 20,159 in February, up slightly from January. New listings hitting the MLS (not shown on graph) in January were 9,833 which is way below previous Januarys – January 2011 (12,290), January 2010 (13,148), January 2009 (13,756), January 2008 (15,903), January 2007 (15,857), January 2006 (16,155), and January 2005 (10,549). At current prices, significantly fewer homeowners are putting their Phoenix homes up for sale which is one reason why the inventory of homes listed for sale in metro Phoenix has plunged. The Phoenix median home price (green line) increased $4,900 in November, $100 in December and $3,500 in January to $128,500. This is a very strong beginning to the high season which starts in January and starts to show up in closings in February. Most impressively, the recent Phoenix median home price increases happened without the temporary $8,000 tax credit which drove the price increase in 2009 (and led to the price declines in 2010). Metro Phoenix single family home sales (blue line) in October (6,464) were the most sold in any October since October 2009 (7,034) when sales were pumped up by the $8,000 first-time home buyer tax credit. Factoid: More than twice as many homes sold in metro Phoenix in October 2011 (6,464) than in October 2007 (3,194). The number of homes listed for sale in metro Phoenix (red line) stopped falling (more or less) in October and increased slightly in November. Compare 2011 to 2009 when the inventory of homes leveled off in August (much more typical) instead of October. In October 2011, we only had 9,654 new listings hit the market which is a 20% decline in new listings compared to October 2010 when we had 12,054 new listings hit the market. In fact, the number of new single family homes hitting the metro Phoenix market in October 2011 was lower than any October in more than 10 years. The Phoenix median home price (green line) declined a bit ($500) in October to $120,000 compared to September. The median price often weakens in the fall. Metro Phoenix single family home sales (blue line) in September (6,747) were the most sold in any September since September 2009 (6,923) when sales were pumped up by the $8,000 first-time home buyer tax credit. Factoid: More than twice as many homes sold in metro Phoenix in September 2011 (6,747) than in September 2007 (3,169). The number of homes listed for sale in metro Phoenix (red line) finally stopped falling (more or less) in October. The unusually high number of home sales has been pulling down the inventory of homes available for sale while at the same time new listings hitting the market have been unusually low. So, all the homes sold were not replaced by new listings and inventory fell. In September 2011, we only had 9,498 new listings hit the market which is a 25% decline from September 2010 when we had 12,601 new listings hit the market. In fact, the number of new single family homes hitting the metro Phoenix market in September 2011 was lower than any September since September 2001. Realtor Inside Baseball. Bank asset managers have been stringing along their Phoenix real estate agents for many months saying that they (the banks) had a lot of foreclosures in process that they soon would put on the market. Soon hasn’t come yet. Still no bump in new bank listings. I don’t think there will be. I think that was just the banks’ party line to string along real estate agents. The Phoenix median home price (green line) finally bumped up in September to $120,500, which was 4% above August. We haven’t seen a median that high since last November but, honestly, the median home price in metro Phoenix has been pretty much flat since last December. That price increase – at a time of year when prices usually weaken – helps me feel more comfortable in my prediction last month that tight inventories will cause the median Phoenix home price to move sharply higher in 2012 to well above the highs of 2009 ($135,500) and 2010 ($137,900). Metro Phoenix single family home sales (blue line) in August (7,450) were the most sold in any August since August 2005, the boom year for home sales. The inventory of homes listed for sale in metro Phoenix (red line) continued to fall. The unusually high number of home sales has been pulling down the inventory of homes available for sale while at the same time new listings hitting the market have been unusually low so all those homes being sold are not getting replaced by enough new listings and inventory falls. In August 2011, we only had 10,089 new listings hit the market which is a 21% decline from August 2010 when we had 12,849 new listings hit the market. In fact, the number of new listings in August 2011 was lower than any August since August 2001. The Phoenix median home price (green line) hasn’t started to rise yet. Despite the very low inventory of homes available for sale, in August 2011 the median Phoenix home price fell slightly to $116,050. I expect, however, that due to the tight inventory of homes for sale that we’ll see the median Phoenix home price move sharply higher in 2012 to well above the highs of 2009 ($135,500) and 2010 ($137,900). Metro Phoenix homes sales (blue line) fell back to earth after the stratospheric Phoenix home sales in June 2011. Metro Phoenix single family home sales in July (7242) were still 21% above July 2010 (which crashed after the first-time home buyer tax credit ended in June 2010) but were below July 2009 sales (7993). Surprisingly to me, the inventory of homes listed for sale in metro Phoenix (red line) continued to fall, that is, in mid-August the inventory of listings was less than in mid-July. As I said, home sales fell in July but the number of NEW listings (not shown on the graph) fell as well so the inventory of single family homes listed for sale in metro Phoenix fell. The number of new listings hitting the market in July was lower than any July in at least 10 years, according to my interpretation of MLS statistics. A big discussion among real estate agents is whether the banks have a shadow inventory and whether banks are going to start releasing their inventory onto the market. ADDED: I may be making this more complex than it is. You don’t have to have a Masters Degree in Economics to look at that red line and know that something major is changing in the metro Phoenix real estate market. Let’s not over-think this. Wow! Phoenix home sales continued to be huge through May and the inventory of homes listed for sale in metro Phoenix continued to tank through mid-June. But the median home price continues to be essentially flat which I did not expect. The groundwork has been laid for the median home price in metro Phoenix to start to rise… but when? Watch the video for my comments on Phoenix real estate market trends. Wow! March home sales were huge! But the median home price was essentially flat. I don’t expect that to last long. Watch the video for my comments. It’s looking like 2011 is going to be kind of a “normal” year. Well, I guess there’s no such thing as a normal year but it certainly looks like things are NOT going to get worse… unless maybe if you’re a home buyer. Phoenix area home buyers face the risk of rising interest rates this year and maybe next year, rising prices. It’s always interesting watching the Phoenix real estate market. You never know what’s going to happen! Of course, the end point of the inventory line is March 15, not February 15, as I said in the video. Sorry about that!